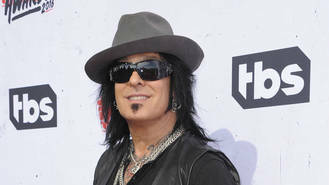 Former Motley Crue rocker Nikki Sixx has signed on to help mentor wannabes on new Canadian TV talent show The Launch. The bassist will join Boy George, Shania Twain, Fergie, Alessia Cara, Julia Michaels, and Jennifer Nettles as experts on the new six-part series, based around unsigned talent trying to create a hit song. In each episode, one of six acts will be mentored by Sixx and his fellow stars as they write a new song. The series will debut in 2018. This won't be the first time Boy George has worked closely with a member of Motley Crue - the Culture Club singer enjoyed a love/hate relationship with singer Vince Neil when the two stars competed on this year's The New Celebrity Apprentice in America. Producers had to step in at one point and halt filming to stop a fight after the two stars fell out while recording together. At one point, Karma Chameleon singer Boy George, a recovering alcoholic, turned on the former Motley Crue star when he refused to stop drinking wine during studio sessions, stating, "I do not need to be in the room with someone drinking alcohol. It's just not a good look for me. I'm not happy about it at all." Neil fired back, "You can't put your sobriety on everybody else." Ironically, the odd couple's original song and video for Trident's Cherish Your Teeth advertising campaign was declared the winner of the show's musical challenge. Fergie couldn't resist having her son Axl feature on her new album after he began copying his pop star mum. Cher has filed a lawsuit against pharmaceutical company executives alleging she was duped into selling shares. Katy Perry is awaiting official word from the Pope before she can turn a Los Angeles convent into her new home. Metallica's Lars Ulrich worries about members of the group potentially burning themselves out. Pop star Demi Lovato was banned from spending time with her little sister at the height of her drink and drug troubles. Tina Knowles has dished on her daughter Beyonce's "adorable" and "beautiful" new twins. Demi Lovato doesn't want to reveal who her song Tell Me You Love Me is about, because she'd rather keep it to herself. Steven Tyler reportedly suffered a seizure shortly after Aerosmith's gig in Sao Paulo, Brazil on Monday night (25Sep17). A musical based on Cher's life will open in Chicago, Illinois before its Broadway debut next year (18).